I love pizza – but my stomach does not. Lately I seem to have a hard time digesting heavy, carb loaded, gluten food. I have tried many low carb recipes and they have all been great but this is my new favorite! It tastes like take out pizza and when sliced, can easily be picked up and eaten with your hands. The ingredients I used for the crust was an 8 ounce bag of shredded mozzarella cheese, 3 ounces of cream cheese, 1 cup almond flour, 1 egg, 1/4 cup grated Parmesan cheese and a dash of salt, pepper, garlic powder and Italian seasoning. Preheat the oven to 425 and cover a pizza stone (or cookie sheet) with parchment paper. Mix the mozzarella and cream cheese and microwave until all melted. Mix almond flour, Parmesan, salt, pepper, and garlic powder in another bowl. Add egg, then stir dry ingredients into the melted cheese mixture. Stir together with a spatula until combined and you have a ball of dough. Put the ball of dough on parchment paper and using oiled hands, spread out into desired shape. Take a fork and poke holes over crust to prevent crust from bubbling up. Bake for 10-15 minutes until nice and brown. You might need to rotate the pan halfway through cooking to get even browning. Now you have a pizza crust to top with whatever you desire! I used pizza sauce, pepperoni, peppers, onions, spinach and topped it all with more shredded mozzarella. Pop back in the oven and heat until cheese is melted. That’s all there is to it! Without all those empty heavy carbs, this pizza is really filling. You probably only can eat 1 or 2 slices to be satisfied. The pictures above show my pizza before it went in the oven, after it was done cooking, and then sliced. So, if you are like me and trying to cut down on wheat, gluten, or carbs – give this pizza a try. I promise you will not be disappointed! So what do you do with big, thick pork chops – ummm, nothing! I got these huge thick pork chops from Costco and was thinking how I should make these since they were so thick. I decided to not do any fancy recipe but just to pop them under the broiler with a flavorful rub. In a bowl I mixed some olive oil, smoked paprika, garlic powder, onion powder, salt and pepper. I rubbed this over the pork chops and put on a foiled lined sheet pan. I baked in the oven at 400 degrees for about 15 minutes, flipped over and baked for 15 more minutes. I then turned the broiler on high and browned the chops on both sides – yummy! A tossed salad on the side rounds out this simple yet flavorful dinner. Trying to watch your carbs but don’t think you can enjoy comfort food? Think again! Tonight I made a meatloaf with marinara and mozzarella and cauliflower rice – pure comfort. I used 1# of meatloaf mix (beef, pork, veal combo) and added 1 egg, some Parmesan cheese, beef stock, onion powder, chopped basil and parsley. Mixed till combined and formed into a loaf. I put the loaf on a foiled lined cookie pan and cooked at 350 for 30 minutes. Remove from the oven, spread with your favorite marinara, pizza, or spaghetti sauce and put back in the oven for about 5 minutes. Then sprinkle top of meatloaf with shredded mozzarella and put back in oven till cheese is melted and lightly browned. Allow to cool then slice. For the rice I took some cauliflower florets and pulsed in my food processor until it resembled rice. In a saute pan, drizzle some olive oil and add about 2 sliced green onions. Cook 1-2 minutes then add the “riced” cauliflower and stir to combine. Cook 5-8 minutes until cauliflower softens but does not get mushy. Remove cauliflower from pan and put into bowl. Squeeze the juice from 1/2 lime over rice and stir. Salt and pepper to taste – yummy! A delicious low carb, grain free, comfort dinner. Add a nice tossed salad and you have a complete meal. Well Hello new Easter favorite 🙂 My new creation of Asparagus Pesto will be making it’s appearance on our Easter table this year and for many more to come. With asparagus so abundant this time of year this recipe was a no-brainer and I can’t believe I haven’t thought to make it sooner. I see serving this over ham, hard boiled eggs, dipping kielbassa in it, etc. The possibilities are endless! I took a bunch of fresh asparagus, cut off about 1″ of the woody stems and roughly chopped the spears. I put the cut asparagus in my steamer and steamed for about 3-5 mins until bright green. I then immediately put them into a bowl of ice water to stop the cooking. I put the cooled asparagus, 2 garlic cloves, and about 1/3 cup shredded fresh Parmesan cheese into my food processor and processed until smooth. With processor running, I poured in about 1/2 olive oil and processed until smooth. Add salt and pepper to taste and process to blend. Now with it being Easter and all, I decided to add a tablespoon of fresh horseradish. Around our house we always have some kind of horseradish and I thought this would make a nice fresh addition to the pesto – and I was right! The tablespoon did not make it hot, it just brought out the garlic and cheesy flavor. Now this addition is completely optional but I highly recommend it. Keep a look out for many more dishes and ideas on how I use this asparagus pesto! It’s Labor Day Weekend and I have been in the Kitchen all weekend 🙂 Strange, but it is complete therapy for me. This weekend on the menu is baby back ribs, broccoli salad and bacon wrapped asparagus on Saturday. Sunday is burgers on the grill. Monday will be hot dogs and any leftovers! To make the ribs, I took a small rack, washed then rubbed with garlic powder, onion powder, salt and pepper. Then put in crock pot and cooked on low for about 3-4 hours. I then put them on the grill to crisp up. I basted them with a homemade BBQ sauce made of tomato sauce, tomato paste, worchestshire sauce, liquid smoke, diced onion, grated garlic, and yellow mustard – Yum!! For the broccoli salad I took about 4 cups of chopped broccoli and steamed for 3-4 minutes until sligh tly softened and bright green. I immediately put into a bowl of ice water to stop cooking and cool down. Drain and let dry. In another bowl I mixed 3/4C mayo, 1/4 sour cream, 2 Tbsp. apple cider vinegar and 1/2 packet Truvia sweetener. Pour dressing over broccoli and gently toss. Then stir in 1/2C shredded sharp cheddar cheese, 6 pieces of bacon that were cooked crisp and chopped, and 1/4C roasted sunflower seeds. Toss all together and serve! What are you chewing this holiday weekend?? I almost always make my own salad dressing. The fresh flavor is so worth it and once you taste homemade it’s hard to go back to bottled dressing. Most of my dressings are just simply oil, vinegar, and fresh herbs. Today I had a large container of grape tomatoes from Costco and decided to use them before they went bad. Grape tomatoes are wonderful since they always taste like a homegrown tomato. I put the tomatoes in the food processer along with 4 garlic cloves, a half of onion, dried italian seasoning, and salt and pepper. I then processed until all where chopped, mixed and liquidfied. I then added about 1/4 cup of red wine vinegar and turned the food processor on. While running, I poured in olive oil until I can hear it thickening. It was probably 1 – 1 1/2 cups total of oil added. Then pour into a jar and refrigerate until ready to use. The fresh flavor of this dressing is hard to beat. The whole house smells of homegrown tomatoes, garlic and herbs! I have a bunch of ideas floating around in my head on how to use this dressing. Of course it will be wonderful over a bowl of crispy green lettuce, or I may just slice big chunks of mozzarella cheese and drizzle this over that. Also cucumber salad comes to mind – so many choices! What are your favorite dressings and marinades? Do you make fresh? Share what you are chewing!! A good piece of grilled meat is hard to beat. A little salt, pepper, and charcoal flavor is all it really needs. To me, it’s all about the sides. Tonight I grilled some chicken thighs until smokey and crispy. I wanted a side dish with big flavor and boy did this brussels sprouts dish deliver. I started out by browning a few bacon strips cut into pieces in a pan on the stove. When crisp, I drained all but about 1 tablespoon of the fat. I cut brussels sprouts into strips and tossed in pan with bacon along with about a half of onion also cut into strips. I stir fried until the sprouts were softened about 10 minutes. I then threw in a handful of halved pecans and a teaspoon of butter. Add salt and pepper to taste and warm through. Put into dish and serve. A side dish worthy of any kind of meat you pair with it. P.S. – here’s a hint when making sprouts. When done, sprinkle with a little lemon juice or my personal favorite, a drizzle of vinegar. I have used red wine vinegar, apple cider, or even malt vinegar. The “tang” of the vinegar really brings out the wonderful flavor of the sprouts. As most of you know (or maybe you didn’t), I have been experimenting with going wheat and grain free. Although I have to eliminate certain ingredients, it by no means that I have to give up dishes I love to eat! 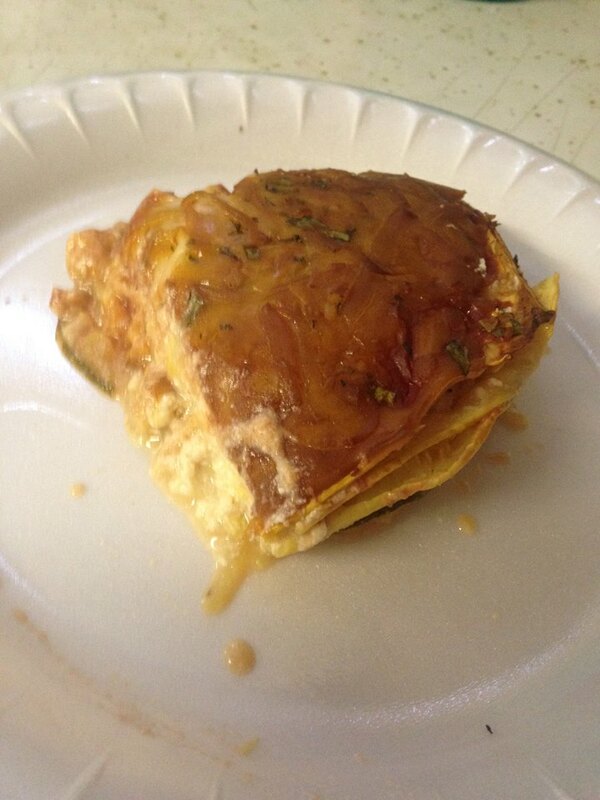 For lunches this week I decided to make a zucchini lasagna – an all time favorite. Since it’s the weekend and I will have the smoker on, I decided to put it in there. Plus it’s close to 90 degrees in the Burgh and I did not want to turn the oven on and add more heat to the kitchen. I started out by taking a medium size zucchini and yellow squash and sliced into thin slices on my mandoline. Since zucchini releases alot of water when cooking, I quickly cooked the slices in my grill pan about 2-3 minutes per side and put on a paper towel to drain. After all slices were nicely grilled, I layered them in the dish just like a regular zucchini recipe. I mixed ricotta cheese, mozzarella, parmesan, an egg and herbs in a bowl. Layer and stack just like a traditional lasagna recipe. Top with more shredded cheese (cause you can never have enough cheese) and either bake uncovered in the oven at 375 for 30-45 minutes or do like I do and pop in the smoker at 225 for 2-3 hours. The results were yummy and will make a great lunch along with a salad this week. Click on the pictures for a close up and let me know what you will be having for lunch this week.